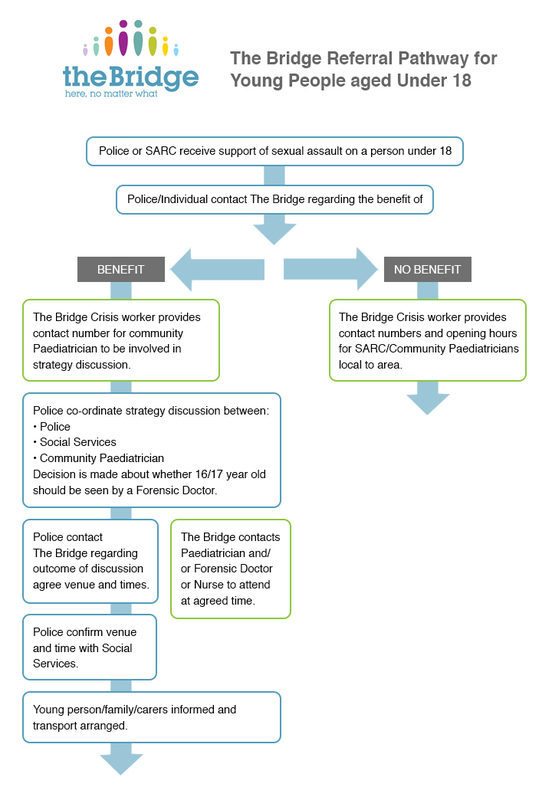 The Bridge exists to support any woman, man or young person who has been raped or sexually assaulted. We provide emotional, medical and practical care and support, including a free, specialist counselling service for anyone assaulted within the last 12 months. We also provide forensic medical examinations with and without police involvement, giving clients the freedom to have evidence collected without the pressure to make an immediate decision about reporting to the police. The Crisis Worker who answers can provide information, advice and support. As from the 1st October 2018, The Bridge – Sexual Assault Referral Centre in Bristol, lead all paediatric cases in Avon and Somerset, Gloucestershire, Wiltshire and Swindon force areas. This is for acute cases that require a forensic medical examination. For cases that are outside of the forensic window in Swindon, Wiltshire and Gloucester, children will be supported by the local community paediatric team and local sexual violence services in their respective areas. All children from Avon and Somerset will continue to be supported by The Bridge. We also now have a full-time male crisis worker in our team. For paediatric cases, we are able to see or speak children and/or their families, Monday to Friday, 10am – 6pm and on weekends 12pm – 4pm. For children aged 13 and under, this will need to be with the co-operation of the police force in their area. For children aged 14 and above, we do not need to have police involvement although we may have to speak to the police.